Half term is back with us but that does not mean the party has to stop ;-). 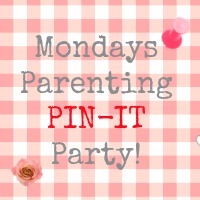 We are back with the original party lady, Mum of One, for this week’s parenting pin it party so nip over and share some bank holiday love. Each week we get lots of fabulous entries so why not pop over to see what inspired Jenny last week.